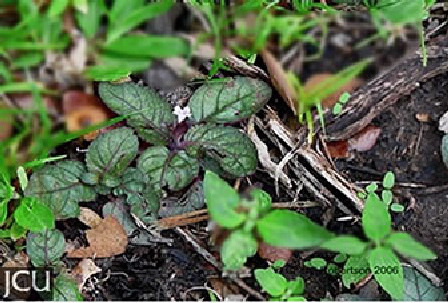 This diffuse, branching herb is usually less than 15 cm tall; the undersurface of the leaves is purple. The flowers are sessile or almost, corolla pale blue, bracteoles are absent and the capsule is about 12.5 mm long. A closely related species is Brunoniella acaulis, this almost stemless species has leaves forming a basal rosette, the flowers are solitary and borne on an elongated pedicel, bracteoles present but short; capsule 12-16 mm long.